Pour 1/2 cup maple syrup into a small saucepan over medium heat. Add in the cranberries, orange zest, liquor (if using), and cinnamon. Bring to a simmer and mix until all of the cinnamon is smoothly combined and the berries begin to pop (if you’re using fresh cranberries), about 5 minutes. Turn off the heat and cover while you make the pancakes. Whisk flour, sugar, baking powder, baking soda, and salt in medium bowl to combine. Whisk egg, vanilla, orange zest and melted butter into the milk mixture (or buttermilk) until combined. Make well in center of dry ingredients in bowl; pour in milk mixture and whisk very gently until just combined (a few lumps should remain). Do not over mix. Heat 12-inch nonstick skillet over medium heat for 3 to 5 minutes; add 1 teaspoon oil or butter and brush to coat skillet bottom evenly. If using an electric griddle, you can set the heat to the second highest setting. 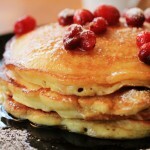 Pour 1/4 cup batter onto 3 spots on skillet; sprinkle 1 tablespoon dried cranberries over each pancake. Cook pancakes until large bubbles begin to appear, 1 1/2 to 2 minutes. Using thin, wide spatula, flip pancakes and cook until golden brown on second side, 1 to 1 1/2 minutes longer. Serve immediately with butter and syrup, and repeat with remaining batter.